Meet Molly, a determined 12-year-old girl who likes to giggle and play with her sister. Molly also has PHACE syndrome, a condition affecting the arterial formation in her brain, which led to a stroke. Although Molly has regained some movement and speech, she is wheelchair dependent and needs help with all aspects of daily life. 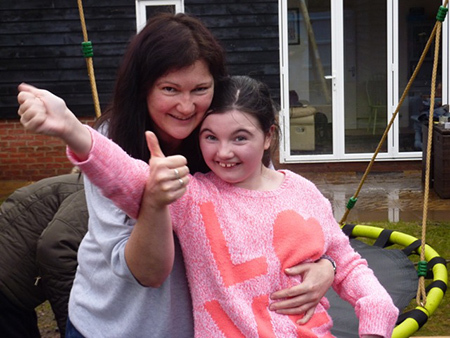 The family garden was inaccessible to Molly until a blustery weekend in March, when an enthusiastic group of 14 Amgen United Kingdom volunteers teamed up with WellChild to undertake a garden makeover project at Molly’s family home. Along with friends of Molly’s family, the Amgen team dug into their work removing grass, painting, digging foundations, and transporting wheelbarrow loads of materials. Despite persistent rain and occasional snow, after two days of heavy, manual labor the new garden was complete. The makeover includes a decked “chill out” area with raised beds for sensory planting, a bird’s nest swing with rubber matting for a fun, safe play space, and a wheelchair accessible gravel path. If Molly gets her way, the garden trellis will be trimmed with fairy lights. Whether it’s volunteering time and talents or making a financial donation, Amgen staff take action to improve the lives of others and the environment in their communities. Making an Impact Around the Globe is a monthly feature that highlights the variety of ways our staff use their Amgen Impact Day to make a positive difference in their communities.